Offline, Josh Draper is a 45-year-old architect, designer and teacher at Rensselaer Polytechnic Institute who lives in Brooklyn and works at the firm PrePost. Online, Josh Draper has more than 2 million Pinterest followers — making him one of the network’s most popular men. A sample of Draper’s boards. His taste is approachable, but better than yours; he sees things you and I don’t see, can group things together in ways that seem alternately simple and opaque. Pinterest, being largely visual, makes it hard for anyone to actually discuss their taste, which is a good thing; instead, it’s presented just as pictures, rather than a bunch of pretentious jargon. Looking through a Pinterest board of the most popular users reveals thumbnail after thumbnail of beautiful young women, all with casual, but suspiciously well-lit, profile pictures. Many boards are for coordinating bridesmaid dress colors and organizing one’s collection of art deco-inspired furniture options. But talking to Draper, it becomes clear that Draper, who is, you know, male, hasn’t assimilated to the Pinterest nation by learning to speak its language and adapting to what is expected on the network. And yet, even though he doesn’t fit the expected demographic, it turns out that Pinterest was made, unexpectedly enough, for him. Social media networks have reputations — sometimes based in reality, sometimes not. With its resumes and prompts to network, LinkedIn is for boring suits. Frenetic and inherently short-form, Twitter is for comedians and obsessive media consumers. Facebook is Facebook — the reigning King of Social Media, home to baby pictures and ill-advised political statements. And Pinterest is for women. Maybe that’s because Pinterest has long been a confusing social network for professionals; it’s this globby web of images with more than 50 million users making scrapbooks called “boards” of images curated from all over the web — photographs, drawings, pictures of products you can buy, pictures of places you can go, anything at all. They also can follow other users to see when they’ve added any new boards or images, and if they see something they like, they can “re-pin” it to one of their own boards. The pins are all links, so if you click them you’ll be taken to whichever site the person who pinned it found it from. But to Draper, aside from the majority, there’s nothing specifically about using Pinterest that would indicate that it somehow speaks more to women. And, curiously enough, Draper’s existence on Pinterest appears to be for professional use, rather than the boredom-killing browsing that defines most other social networks. Draper responds: “People who don’t want political content on Pinterest usually just don’t want the stuff that they don’t agree with. And Pinterest is full of political content. Most users have a board that’s political. Turns out, Pinterest is a perfect social network for Draper — who falls in a category of men you could designate as the “Design Bro.” The Design Bro will use the word “creatives” to refer to a group of people, will express reverence for and/or strong opinions about certain touchstones in art and architecture (Dieter Rams, Arne Jacobsen, Philippe Starck), are hyper-aware of certain locales (Copenhagen, Tokyo, San Francisco) and can jump back and forth between art talk and marketing talk without ever marking a line between the two. (In the Design Bro’s mind, artists think he’s a money person, and money people think he’s an artist.) The Design Bro is to culture what the Tech Bro was a half-decade ago: It’s his time. Everything falls under his purview. And everyone wants him. 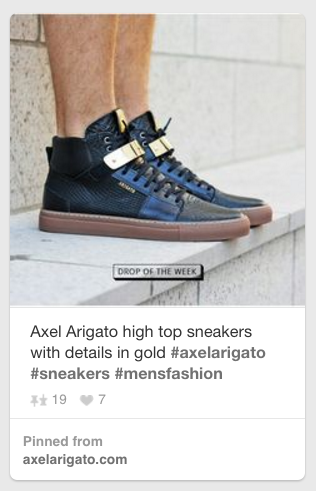 Most of the most popular male Pinterest users are Design Bros. This shouldn’t be surprising given how perfectly Pinterest provides a utility for the Design Bro: He gets to show off his excellent taste in visuals (largely to women) and indulge in his love of collection at the same time. Why the popularity? Draper’s theory is thus: when you sign up for Pinterest, the system asks you to choose among a selection of images for things you like, to give its recommendation algorithm a little data to gnaw on. Draper knows that thanks to a bump from Sharp, the process that suggests boards for new users to automatically follow suggests Draper. His “Products” board, which has several times more followers than his next-most-popular board, is on that list. “Products” (subtitled “cool stuff”) includes 3,300 pins — stuff anyone can easily buy — from a cloud-shaped cement toilet paper holder to a sandwich cutter that cuts out in the shape of puzzle pieces. “I was someone who could kind of anchor the site, because I was constantly providing content,” he says. “Products” isn’t his favorite board, but he’s kind of stuck with it, because it overperforms all his other boards by so much. But that’s important, because Draper makes some money off of Pinterest. Not much, he says, and not often, but sometimes. “I seem to have some kind of goldmine — two million followers on a successful social media network — but I haven’t figured out a way to make a lot of money with it,” he says. Still, he leverages his power and mild fame from Pinterest into work, sometimes using his own Pinterest account, sometimes not.